On Saturday 26th March 2011 half a million people descended on the streets of London to take part in the march organised by the Trade Union Congress. Whilst they came for different reasons, protestors were united in their message to the coalition government – stop the cuts. Check it out below – feel free to leave any comments! On the 17th December 2010, when Mohamed Bouazizi set himself on fire in front of a Tunisian police station, the world changed forever. Bouazizi’s death, which was seen in Tunisia as a symbol of the desperation which they so many felt under the autocratic regime of President Zine El Abidine Ben Ali , lit the touch paper for a revolution which spread far beyond one country’s borders. Since then, Egypt has overthrown its own longstanding tyrant in its struggle for democracy, and there has been continuous (and ongoing) unrest all across the Arab world: Yemen, Bahrain, Jordan, Syria, and of course Lybia, where Britain, France and the US are currently enforcing a no-fly zone to protect Libyan citizens from Colonel Gadaffi’s attempt to quash the revolution. The revolutionary contagion spreading across the Middle East has been blamed (or credited, depending which angle you’re coming from) on many things: repressive regimes which deny their people freedom; a huge population of young people who feel frustrated and let down by their leaders,; and finally, the rise of social media, which has allowed people to share information and organise themselves online, in a way that would simply not have been possible even two years ago. But referring simply to “social media” as being the catalyst for these uprisings is too broad. It’s not just the messages that people have been able to send each other, arranging where to meet, or gathering so many people online that they are able to develop a critical mass, so that they can be sure of safety in numbers before even heading out onto the streets. One of the things that galvanised people most into acting was the fact that VIDEOS of different protests were available online so quickly after the event. People could see with their own eyes what was happening. This was especially true when it came to government’s attempts to crack down on protests. For example, the footage of an Egyptian police van deliberately accelerating as it entered a crowd of protesters, running over several people, demonstrated in one 10 second clip the brutality that the Mubarak regime was prepared to use to suppress its own people. The use of online video to document abuses by different governments during the Arab uprisings has been instrumental in forming opinion not only among people in those countries, but also in the international community. Which in Libya’s case has made all the difference. So surely this can only be a good thing, spreading information and calling governments to account? What harm could it possibly do? Read on for the counterargument in part 2..
With the huge amount of video that is broadcast online, it can get a little overwhelming trying to wade through all the different content out there. Especially with news, I find that YouTube channels are a fantastic way of getting all your favourite video content in one place. If you want to access different types of video, then by subscribing to your favourite video sources, you can have all of the best videos in one place. When following journalism through YouTube, I like to have a combination of traditional news and citizen journlism video sources. The best YouTube channels for news are the ones which aren’t afraid to put their content out there. Al JAzeera English is particularly good for this. They update their channel throughout the day with new bulletins and highlights from their latest programmes. This approach, which is more open-source than most other large news organisations (e.g. the BBC, which has no dedicated youtube channel) reaps dividends in audience terms. The AlJazeera YouTube channel has over 189,000 subscribers. If you don’t want to get your news from traditional organisations, then YouTube’s Citizen Journalism channel is a great way of finding the best content that is being uploaded to the net. 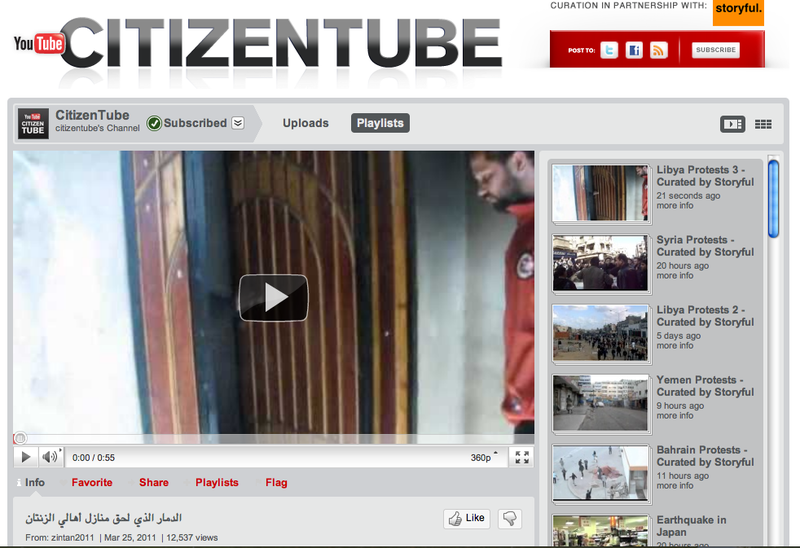 CitizenTube is YouTube’s News and Politics Blog. Here you’ll find important breaking news videos from citizens; developing trends in the use of YouTube by news organizations, activists, politicians, and governments; and lots of other YouTube goodness. Recently they have supplemented this by adding a new section called worldview , where they get world leaders to come on and answer questions posed by the public. This month, they are interviewing the Israeli Prime Minister Benjamin Netanyahu. Last month it was David Cameron. You don’t have to be a news organisation anymore to attract the big names. The world of media is changing…. The unrest in the Middle East over the last month is perhaps the best example to date of the internet’s power in organising and fuelling mass protest movements. The most recent and most fervent of the protests has been in Egypt. So where did it all begin? And what role has online video played in shaping the protests? 25th January marked the first day of marches, riots and rallies. But this was only made possible through the use of social networking sites in the run-up to the 25th. Several days before, online groups had formed, united in their goal to get people on to the street to protest. Youth groups, such as the April 6 Youth Movement, have been credited with starting the protests. The vlog by Asma Mahfouz (below), filmed on 18th January, was one of the first to surface. Her message was spread virally throughout social networking sites, calling for the first day of protest to take place on 25th January – a national police holiday. Once the protest movement had hit the streets, internet activity in Egypt increased exponentially as people in Cairo, Alexandria and Suez documented the protests. They used the internet to plan further protest and to upload pictures and videos to document what was going on in the streets. 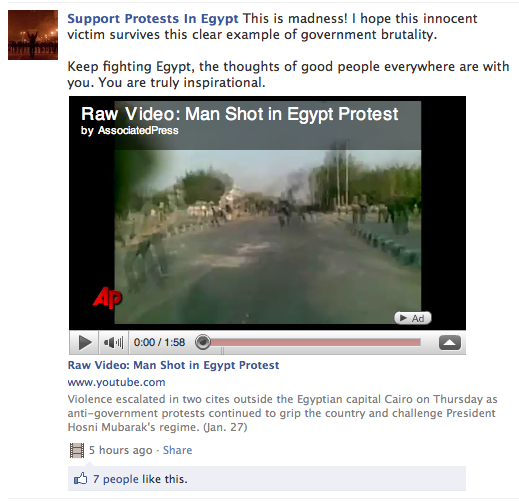 Barack Obama even gave his response to the Egyptian protests via a live stream on the White House’s YouTube channel. The Egyptian government eventually recognised the powerful role that the internet was playing in facilitating the protests. And they did try and put a stop to it. 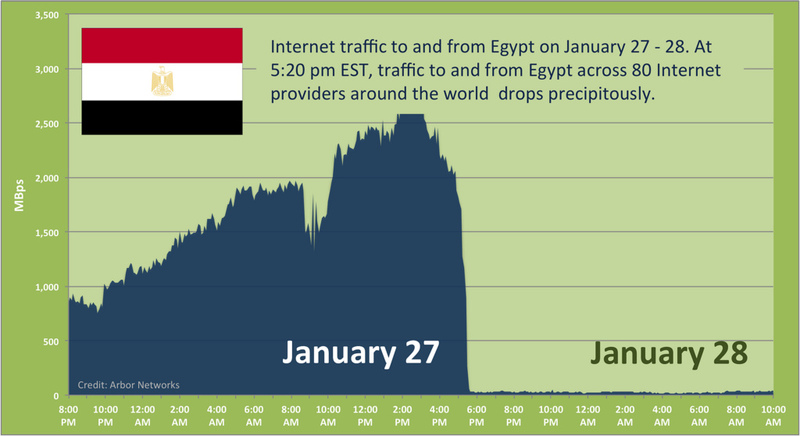 As the graph below shows, they succeeded in virtually shutting down the internet across Egypt on 28th January. But by then, it was too late. The wave of protest had already swept across the country’s largest cities and there was nothing that could be done to stem the flow. Video has been one of the most powerful mediums of all for the Egyptian protester journalists. Despite the effective closure of the internet by the Mubarak regime, videos were still finding their way onto Facebook and Western media sites. Mobile phone footage enabled protesters to capture the moments that professional camera crews had missed. The extent of the unrest was clear for all to see, but the most powerful videos were those that exposed the brutality of the Egyptian police. 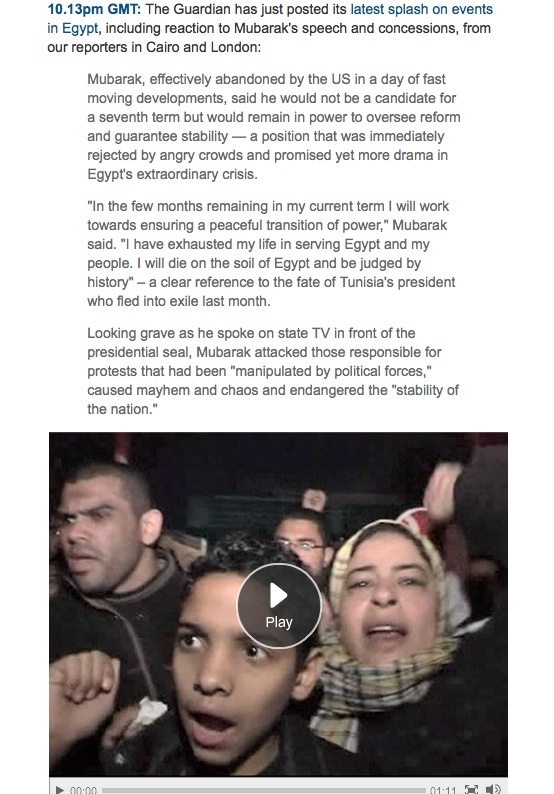 Support for Mubarak’s regime was further eroded when the death of Mohamed Attef was captured on video. The 17 year-old was shot dead by police during a stand off with protesters. The footage was taken by a member of the public, who passed it to a local journalist, who subsequently passed it on to AP. From there, it found its way on to Facebook groups, boosting support for the protesters’ cause both in Egypt and abroad. International broadcasters have played their part, too, in spreading the message of the protesters via online video. AP (as mentioned above) and other agencies have been posting a constant stream of user generated videos on their websites. The Guardian’s live update service has provided excellent snapshots of the mood in Cairo and other cities. Last night after Mubarak’s much-anticipated address to the Egyptian people, videos were quickly uploaded to the Guardian’s live feed showing the reaction amongst protesters gathered in Tahrin Square (see below). Al Jazeera’s 24-hour coverage, although mainly viewed on television, is also streamed online. The English Al Jazeera channel was so popular that Livestation, a website that streams Al Jazeera, crashed because so many people were trying to access it. Today, as the protests enter their ninth day, it has been reported that internet access has been restored to most of Egypt. The Egyptian government has clearly realised that shutting down the internet was too little, too late. Whatever happens to Mubarak and the protest movement, it is clear that online video journalism has played a fundamental role in this mass protest movement. These days, technology is everywhere. The potential to communicate, connect and collaborate with others is higher than ever. It is the technological and information revolution that has fuelled the rise of citizen journalism, where all over the world people are using increasingly sophisticated devices to capture moments and events that would otherwise go unseen. The most basic and primitive mobile phone now is likely to come with a in-built camera and/or even a video camera. And so now the masses have access to this technology which was once a preserve of the few. This means that it is not necessary for a camera man or reporter to be present whilst the volcano erupts, because there is probably someone there already holding their phone, filming away. Online video journalism, or video blogging, can be a great way to communicate with communities. If you’re interested in Vlogging, you can easily connect with communities by producing material. You could interview local figures, film local events, or make community profiles. So next time you see something that catches your eye, why not film it? 2) You could either plan what you want to film, or you might see something spontaneously and decide to get filming! 3) Use a USB uploader to transfer the film from your camera phone to a computer. When you plug it in a box should pop up asking you what you want to do – choose ‘open folder’. If it doesn’t pop up, find it under ‘external devices’ in your ‘My Computer’ (PC) or under ‘devices’ in your finder window (Mac). Once you’ve open the folder, choose the footage you want to upload. Save it somewhere on your computer.